19 February / The 101st anniversary of the Republic of Estonia will be celebrated in Tartu with ceremonies, speaking events, concerts and other engagements. On Sunday, 24 February, residents of the city are invited to gather at the Kalevipoeg memorial statue, at the University of Tartu Old Observatory for the ceremony honouring the Estonian flag, and the celebration taking place afterwards at Town Hall Square. The city space will also be decorated during the week of the anniversary, with street flags and posts decorated in the national colours and the Town Hall Square building decorated in the colours of the flag adding festiveness to the celebration. On 20 February, the Tartu City Museum and the Eesti Mõttespordi Selts will be holding a history-themed memory game for schoolchildren. At 12.00 in the University of Tartu Assembly Hall, a concert ceremony in celebration of the 101st Anniversary of the Republic of Estonia. At 18.00, a concert ceremony at the Estonian National Museum (by invitation), in celebration of the 101st Anniversary of the Republic of Estonia. Prime Minister Jüri Ratas and Mayor of Tartu Urmas Klaas will be giving speeches. The City of Tartu will be presenting the title of Honorary Citizen of Tartu and the Tartu Täht decoration. At 08.30 – The laying of wreaths at the Memorial to the War of Independence, located in St. Paul's cemetery; at Kuperjanov’s grave, at Raadi cemetery; at the Monument to the Liberators of South Estonia; and the Kalevipoeg memorial to freedom, located in Tartu. 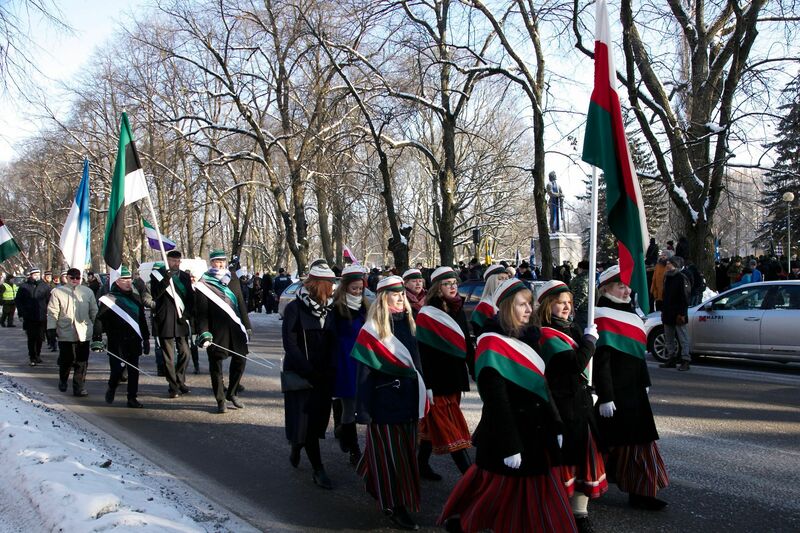 At 9.15 – A festive line-up by the Defence League's Tartu District and student organisations at the Kalevipoeg Memorial to the War of Independence, in Tartu. The following will be speaking: Aadu Must, Chairman of the Tartu City Council and Member of the Riigikogu, Chaplain Priit Tamm, from the Defence League’s Tartu District; and Karel Paan, Chairman of the Tartu convent of the Fraternitas Liviensis Fraternity. At 10.00 – A ceremony honouring the Estonian flag, at the Tartu Observatory. The following will be speaking: Urmas Klaas, Mayor of Tartu; Rain Sangernebo, Chairman of the Management Board of the Tartu County Association of Local Governments; Ants Tooming, Pastor from the EELC Tartu Deanery; Vahur Afanasjev, Tartu City Writer; and Kevin Kanarbik, Vice-President of the Estonian Students’ Society. Also taking part will be men’s choirs and the Wind Band Tartu. At 11.00 – A celebration at Town Hall Square. Performing are Matis Leima (garmon, violin) and Laurits Leima (guitar). Tea will be offered by the Tartu District of the Naiskodukaitse (Women`s voluntary defence organization). At 11.00 – Concert ceremony by the Tartu County Association of Local Governments dedicated to the 101st Anniversary of the Republic of Estonia, in the White Hall of the University of Tartu History Museum (by invitation). At 11.30 – Defence League ceremony in honour of the 101st Anniversary of the Republic of Estonia, in the Assembly Hall of the Estonian National Defence College (by invitation). Starting at 11.00, free guided and curatorial tours (participation with a museum or exhibition ticket) for three exhibitions: ‘Encounters', ‘DIY Estonia’, and ‘The Story of the Estonian Chair. At 12.00, a presentation of the recently published Estonian permanent exhibition catalogue ‘Encounters’ and the book 'Johannes Pääsuke. People and Clothing through the Lens of his Camera’, which reached store shelves last December. The presentation will be followed by a curator’s tour of the permanent exhibition ‘Encounters’. At 14.00, a free concert by the youth wind band Livonia will be taking place in the area around the bridge, and at 16.00 it will be possible to hear Paul Neitsov. On 24 February, Foundation Eesti Terviserajad is calling on the people to visit health trails, to mark the Anniversary of the Republic of Estonia on 100 trails across Estonia. Real-time tracking of kilometres covered will take place on the www.terviserajad homepage. At 11.00 – Tartu’s senior citizens are invited to the concert ceremony, dedicated to the 101st Anniversary of the Republic of Estonia, taking place at St. Paul’s Church. City Writer Vahur Afanasjev will be performing at the concert ceremony taking place at St. Paul’s Church and the atmosphere will be set by the group Kaunimate Aastate Vennaskond. The event is free and intended for all who are interested. The Tartu City Government and St. Paul's Church are looking forward to a high turnout!